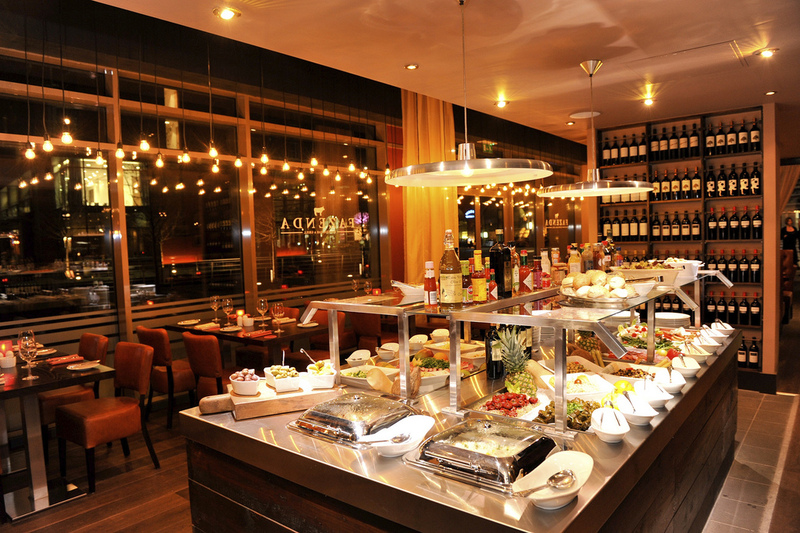 Fazenda is an all you can eat, Brazilian steak house in Leeds although there were also franchises in Liverpool and Manchester. This place is a carnivore’s heaven! It is located through the arches at Waterman’s Place near the city centre. On arrival you pick which menu you would like- meat or veggie. The veggie option is cheaper for obvious reasons and the price for any meal does vary depending on the time of day, the lunch menu is cheaper but that does mean slightly less choice. Saying that there is still plenty of options available. First stop is the salad bar. This island of wonder has one of the best selections you can imagine which has had different options every time I have been. This includes things such as smoked salmon, general salad and a quinoa and halloumi mix. You have to be careful not to overfill on this, unless you are vegetarian of course, because you need to leave room for the main attraction. I would also advise only taking chips sparingly for the same reasons. The various cuts of meat are brought around to your table individually on skewers. If you want to try a certain dish the waiter will slice a bit off which you then grab with some tongs and then devour. There is fillet steak, sausages, rump steak, gammon with pineapple, fillet mignon, chicken skewers and much more besides (again this will depend on the time of day you visit). You can request how rare or not you would like it and each person has a place card that you turn to green if you want more food, or red if you require a bit of a breather. The meat is melt in your mouth amazing and so well cooked and seasoned I cannot recommend it highly enough. I have not tried many of the desserts although we do often get the sorbet (raspberry, lime and mango & passionfruit) as a palate cleanser and sweet treat at the end which again is sooooo damn good. As you may be able to tell I love Fazenda and along with Zaap Thai and El Bareto it is one of my favourite places to eat in Leeds. It is not somewhere to go for a snack, or before a dance rehearsal for that matter which I learnt the hard way, as you will leave with a giant food baby and probably meat sweats as well. We have found that to fully enjoy the experience it is a good choice to fast during the day then go in the afternoon/ early evening. It isn’t the cheapest meal but if you really take advantage of it then it can be great value for money. Have you been to Fazenda? What did you think?